These are very simple and inexpensive foot-operated hydraulic pumps used at shallow depths (less than seven metres) and usually to irrigate small areas. 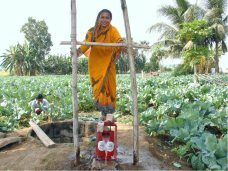 These pumps are used extensively in rural areas of South-East Asia and Africa. The very simple principle was invented in the late 1970s by Gunnar Barnes, a Norwegian engineer, for irrigation in Bangladesh, before being improved and adapted at the end of the 1980s to Africa. It involves a normally inexpensive resource that is easy to maintain. These pumps include the cheapest models (€30 in Bangladesh, €100 or so elsewhere). They can also generate considerable extra revenue for the small farmers quickly, up to two to four times higher. More economical, these pumps are also more efficient that the 2.5 or 5 HP motor-driven diesel irrigation pumps but require physical effort. 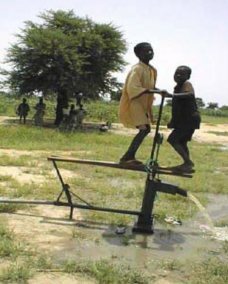 Small farmers with low financial resources for the basic two-treadle models, but also rural municipalities for the one-treadle hydropumps of Africa or Southern Asia, where many manufacturing or sales and maintenance networks already exist. NB. Do not confuse this type of pump with the treadle (one only) hydropumps which can, depending on the model, draw the water from 30, 60 or 130 m deep in hard ground and are used for both irrigation and the water supply. See Sheet no. "hydraulic-drive treadle pumps"
These are the simplest and cheapest. They suction the water from shallow depth and extract it without pressure via a simple orifice or outlet pipe. They suction the water but by generating a low pressure that drives it back into the watering pipes, irrigation channels or reservoirs. The body of these pumps comprises two pipes of about 30 cm, installed on a small wooden or metal platform, into which slide two pistons fitted with check valves at the bottom. The pipes are connected at the bottom to a tube plunging into the water table and at the top to an orifice or discharge pipe. The two pistons are connected by a rope passing through a pulley fixed to the pump frame. 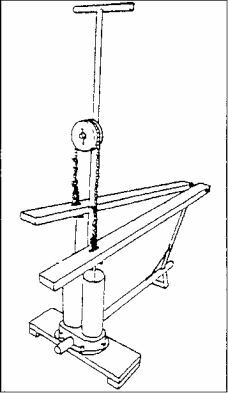 They are moved alternately by rails activated by the treadles (in bamboo, wood or metal) ; the treadles themselves are moved alternately by a person’s feet. The pistons descend, the check valves open and the water pours in when pressure is applied to the treadles. When the pistons rise, the check valves close and the water is held back. - Investment quickly profitable, with significant increase in revenues (often doubly and even quadrupling in two years in Niger according to a survey by the NGO EWW in 2000). Some pump models in fact are called "Moneymakers". - Ecological system avoiding the formation of greenhouse gases as for the diesel pumps. Not insignificant expenditure in human energy. - Impossible, except for some more expensive models, to draw water from more than 7 m deep in hard rock. - Reticence of some communities over the treadle activation system. - Intended for irrigation and not very usable for the water supply. Cannot be used in boreholes. This varies according to the countries and the models and is cheaper than hand pumps. The cheapest models are found in Bangladesh, a country where they have been invented and manufactured on a very large scale and where they can be found from €30. The improved models adapted to Africa cost, for example, in Niger, Mali or Burkina Faso, depending on their characteristics, about €70 for suction-only pumps and €110 to €140 for pressure pumps. Count €100 to €200 to include the costs of creating the associated small borehole. Maintenance costs are low and less than €10/year. - S.K. site Industries in India (Export-Import and installation of hand or treadle pumps) This site, in English, gives information on the various models.